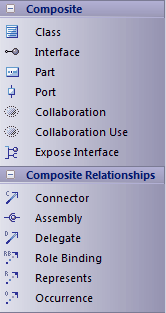 The Composite Toolbox is used to create Composite Structure diagrams. These reflect the internal collaboration of Classes, Interfaces or Components to describe a functionality or to express run-time architectures, usage patterns and the participating elements' relationships, which static diagrams might not show. The Class elements form the basic structure of the diagram, with Interface, Part, Port and Collaboration elements defining the functionality or use of the Classes.